Trusting Hands Day Nursery is located within the Canolfan Gorseinon Centre. We at Trusting Hands aim to provide a high quality of childcare, in a warm, friendly, happy and welcoming environment, for all children. The Nursery which opened in September 2008, is inaccessible from the main building, having its own independent entrance with secure access. 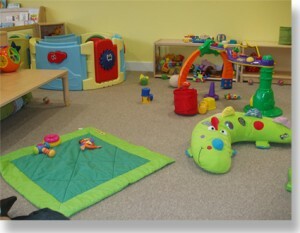 We have two main playrooms – the Buttercup room cares for 18 babies from 3 months to 2½ years old; the Honey-Pot room cares for 24 children, mainly aged 2½ to 4 plus years old. We operate from Mondays to Fridays, 8am to 6pm; with half-days 8 till 1pm or 1 till 6pm; only closing for Bank Holidays and one week between Christmas and New Year. We offer any combination of half or whole days, dependent on availability. 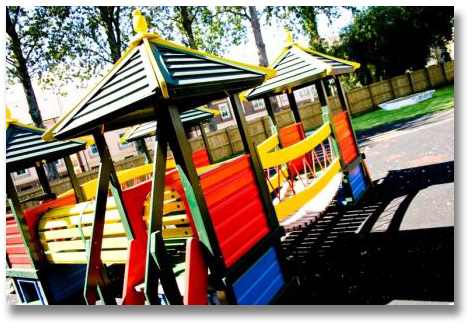 We are extremely fortunate to have a large outside play area, comprising many trees & grassed areas, which is surrounded by a safety surface throughout. The trees provide us with some welcome natural shade during sunny days. We also have 4 separate planters where the children and staff plant and look after flowers, and we grow our own vegetables for eating at snack time. The main area has appropriate large outdoor play equipment, while our smaller fenced section, is for our younger babies, and has smaller appropriate sized outdoor equipment. A variety of outside apparatus, toys and games are stored in a secure brick building, in our garden, so is within easy access. The Nursery has two large, bright playrooms equipped with bespoke furniture, toys and equipment to stimulate and encourage children’s overall development. In the Buttercup Room, we follow babies’ own daily routines for bottle feeding & mealtimes, and can also accommodate their daytime naps, in our quiet area which is equipped with appropriate cots and mattresses. In the Honey-Pot Room, we offer our toddlers, aged 2 – 5 years, more opportunities of playing and learning through the Foundation Phase. This spacious room is set out to offer an open plan environment, making all areas accessible to all children, thus enabling them to make their own choices and explore the various core areas of learning.